When I was offered another custom t-shirt review to do, it seemed to be the right fit for me considering I’ve already done several others, like Wordans and Zazzle. This time though it was for CafePress, and I was thoroughly surprised, because I know a lot of people that use CafePress for getting custom promotional items and are always very pleased with the results. 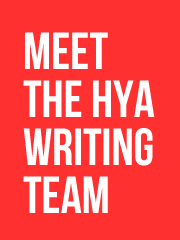 However, just because the promotional items are well done, doesn’t always mean the custom t-shirts are going to come out all that great – so this was my time to investigate! 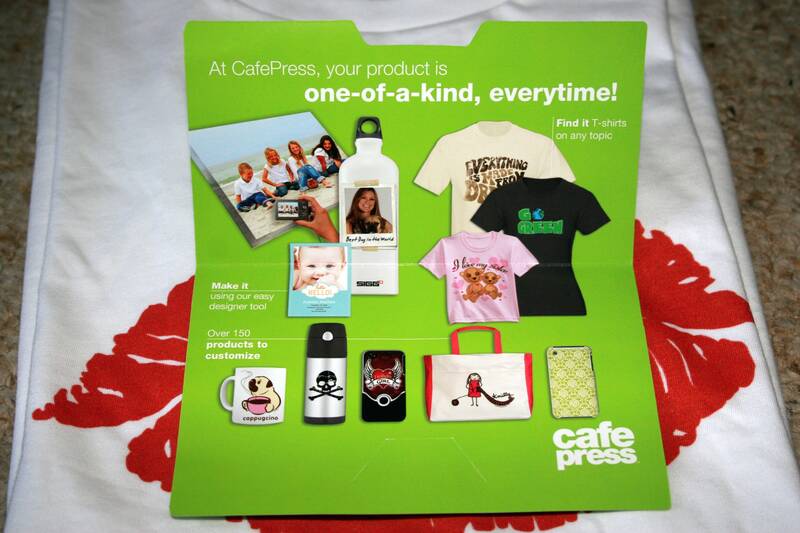 CafePress has everything (and I mean EVERYTHING), literally from customizable iPhone cases, aprons, mugs, jewelry cases, t-shirts, hoodies, baby onesies, home and office decor, stationary, wall art – should I go on? I mean, the list is endless, which is quite amazing. There’s obviously no shortage of customizable ‘stuff’ on CafePress’ website. My interest was in customizing a t-shirt though, so I went right into the Women’s Custom T-Shirt section and started searching for my style. 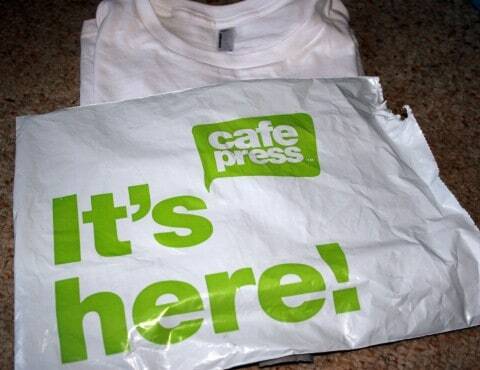 So here’s my first issue, CafePress has such expensive BLANK t-shirts, that even though I was given a gift certificate to complete the review – I was even being money conscious while shopping. I honestly don’t understand why they’re charging $17.99 and upwards for blanks, and this is way before you even get to customizing it. A custom dark t-shirt is $32.50, a custom white t-shirt is $17.99 – that’s odd, right? Like I said though, I was given a gift certificate, so I went for the custom white, because I’m stingy with my ‘non’ money. Let me note that most of these customizable clothing websites have very poor photos of the blank garments which makes it difficult to choose what style you want because you don’t really know how it looks on a person. 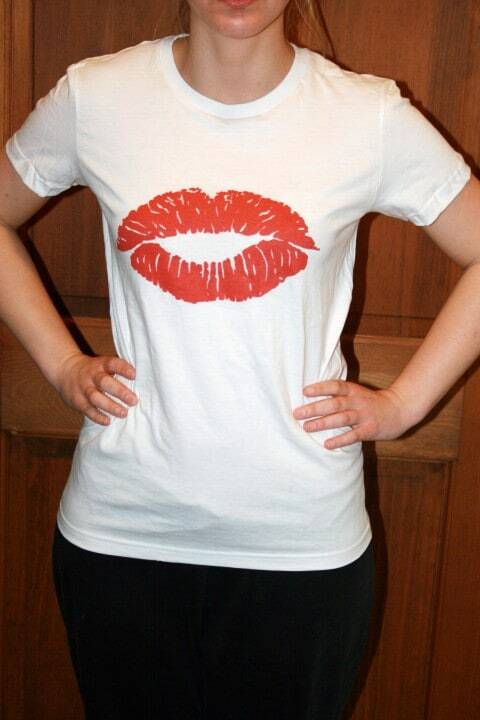 CafePress has simple stock photos of the blank garment on a white background. It’s hard to tell the shape of the shirt, the length or the fit. Moving on, when you get into the Design Center, as I like to call it, they give you a big cheesy image/drawing of the shirt on the background and a box in the center of the shirt to show you where you can design. 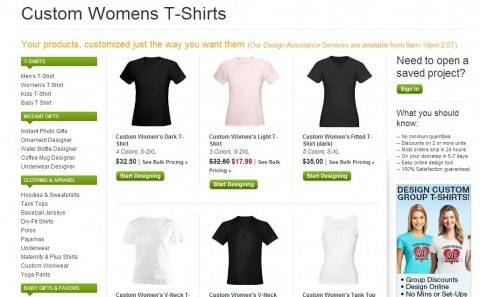 CafePress allows you the option of designing on the front, back or the pocket area of the shirt. The area they give you allows a decent amount of space to place wording or an image, which I liked. It wasn’t too small or too high near the collar of the shirt. They allow you to choose from many different fonts, select an image from their gallery or upload your own, and they give you the option of adding shapes; which is a new one for me, I don’t recall having seen this option before on other websites. My problem is there’s always so much to choose from and play with that I get overwhelmed. I’ve tried several different ways of customizing on the other websites, so on CafePress I decided to go with the ‘clip art’ from their design gallery. They had a great selection of black and white and colorful images to choose from, which left me excited because I like to sometimes overlap 2 clip art images on these customizable tees and make my own brand new image. After playing with that for quite a while, I decided to go with a simple image (just 1) and put it right in the center of the chest area. You can obviously rotate the image, flip it, enlarge or even shrink it. So once you get all that set and decide on how you want it to look, you go over and click “I’m Finished” in the upper right hand corner to move on to the next page. The following page will now lead you to the beginning of the check-out process which is fairly self-explanatory and simple. Select your size, confirm the color of the t-shirt you want, click ‘Add to Cart’ and then enter all your personal info to purchase the product. Now that we’ve gone through the process, I will let you know how the final product came out. I was delighted when it arrived in a custom mailer that ironically read on the front “It’s here!” The packaging was easy and friendly – a no hassle package is a good package! Inside was my shirt folded up with a few goodies to Thank Me for shopping with them and my receipt. The shirt came out great and the print was pure quality. It was a soft shirt that fit me perfectly – however remember I guessed on the style from the poor image, so I was pleasantly surprised when it fit perfect! 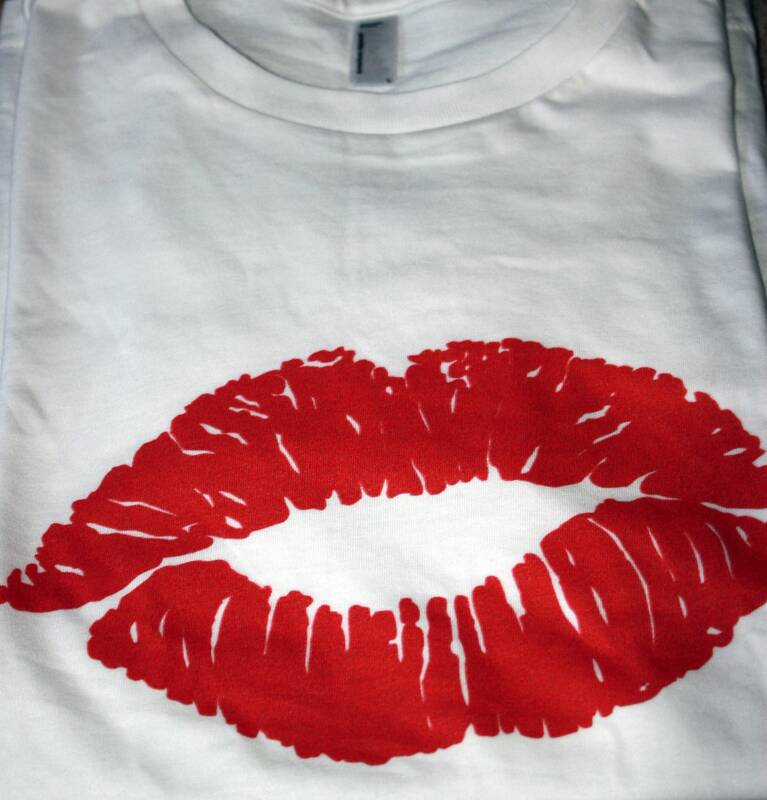 The print was not rough or raised, it blended into the shirt and was just as soft as the tee itself. The shirt still had it’s original American Apparel tag inside – which now explains a little why the price was so expensive. The other thing I took a look at while shopping on CafePress was I noticed they had bulk options so I went to check out the bulk pricing – which I might add was again quite ridiculous. Sometimes us clothing companies take for granted these easy-to-use online shops and printers, so I always like to go ahead and research and check them out. There’s been a few times I was pleased to see the pricing AND quality was much more affordable than going through a regular printing company and working hands-on with them. Unfortunately, I thought I’d be more pleased with CafePress’ pricing, but I wasn’t. Their quality however, was definitely superior and the entire customization process was easy and simple. 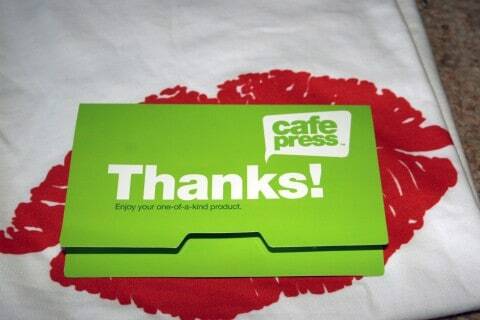 Would I shop with CafePress again? Yes, I definitely would, but I think they should reconsider their pricing strategy. There are quality products that aren’t American Apparel that will draw in more customers because they’re more affordable (we’re still in a recession people). I loved how many options they had on their website because now I know I can go to them for really anything I need, which is always great to know! The design and checkout process was not at all complicated, it all went totally smooth and the t-shirt literally arrived to me with normal shipping in a matter of 3 days (or less). They’re quick, easy and produce a great product! 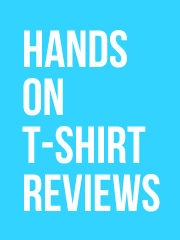 Thank you CafePress for allowing me the pleasure of reviewing your Custom T-Shirt process. If you want to check more out about CafePress, head over to their website and remember they’re on Facebook and Twitter too! Too dang expensive for my blood. I can see the use if your buying in bulk… I guess. Local t-shirt co’s can compete at that price point though. Next post: What’s new at the daily sites for April 11th?